Content: There is some swearing, including a couple f-bombs and the use of the n-word. It’s in the Sociology section (I think) of the bookstore. By now, most of you will have either heard of this or read it, I think. There’s not much to say, summary-wise; it’s a letter from Coates to his son concerning what Coates thinks about being a black man in America. 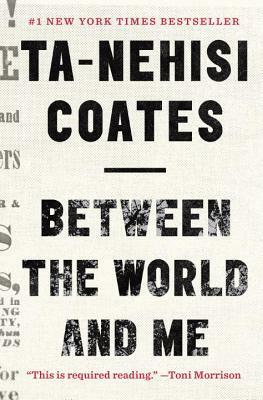 It’s sort of rambling, and kind of disjointed; it feels like a series of random thoughts jotted down on a piece of paper as Coates was musing about his place in this world. Which fits, I think. What it is, really, is damning. Especially if you, as Coates put it, think you’re white. There’s a complacency that comes with being white, with being privileged (even if you’re “just” middle class), that isn’t afforded to those who are not. And Coates, rightly, forcefully, reminds us of that. Reminds us that to be black — particularly a black male, since he’s writing from his own experience — is to bear the burdens of all our complacency. That our “freedom” isn’t free, and that it’s not the military who are paying for it. That all these shootings that are making the news aren’t new, that they have been going on for hundreds of years, and those that think they are white just throw up their hands and turn a blind eye. I am ashamed I made an error, knowing that our errors always cost us more. This is the import of history all around us, though very few people like to think about it. Had I informed this woman that when she pushed my son, she was acting according to a tradition that held black bodies as lesser, her response would likely have been “I am not a racist.” Or maybe not. But my experience in this world has been that the people who believe themselves to be white are obsessed with the politics of personal exoneration. It’s a difficult read, because he condemns everyone and offers no answers. There’s no solutions, possibly because Coates doesn’t have any, and I found that a difficult thing to swallow. I want to know HOW I can change, what I can do to make a difference. Perhaps reading books like this is a start; it has made me aware that there are black men and women who think this way, who believe that they are lesser because we let police arrest and shoot them. Who are not given the same opportunities because they can’t afford to buy a house in the suburbs. Who are treated differently when they walk into stores just because of the color of their skin. It does make me feel hopeless, in a way. But, on the other hand, I’ve read this and I’ve been made aware. Maybe that’s a start.